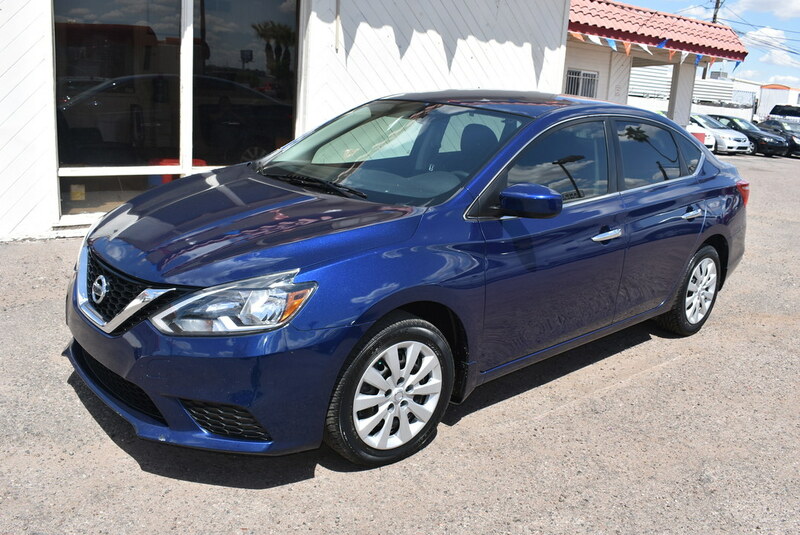 Reward yourself with the stand-out style of our 2016 Nissan Sentra S Sedan presented in [[[TrimColor|Deep Blue Pearl]]]! You'll love the improved connected-to-the-road feeling from this sedan with its 1.8 Liter 4 Cylinder that offers 130hp with the fun-to-drive 6 Speed Manual transmission for easy passing power. With this Front Wheel Drive team, get more out of every day with near 36mpg on the open road and an energetic ride that will have you wanting to take the long way home. Check out the expressive stance of our Nissan Sentra S with its dramatic flowing lines, signature grille, chrome trunk lid finisher, and brilliant boomerang-shaped halogen headlights. Once inside our S trim you will enjoy, remote keyless entry, a 6-way adjustable driver's seat, illuminated steering wheel mounted controls, power windows with one-touch up/down, and 60/40 split fold-down rear seats are nice conveniences. Connect with your ride thanks to Bluetooth hands-free and turn up the volume on an AM/FM/CD audio system with the USB port interface, a radio data system, and speed-sensitive volume control. A Top Safety Pick, your Nissan Sentra provides priceless peace of mind with its advanced airbag system, an anti-lock braking system with G-sensor, vehicle dynamic control, traction control, and a tire pressure monitoring system. Stellar safety, confident handling, stand-out style and a wealth of amenities make this a superb choice for you that's great on the road and easy on your wallet. Maximize your day with the perfect partner - your new Sentra! Print this page and call us Now... We Know You Will Enjoy Your Test Drive Towards Ownership!